Supreme Court 2015: King v. Burwell wasn’t about federalism after all. The Obamacare ruling was supposed to be all about federalism. What happened? 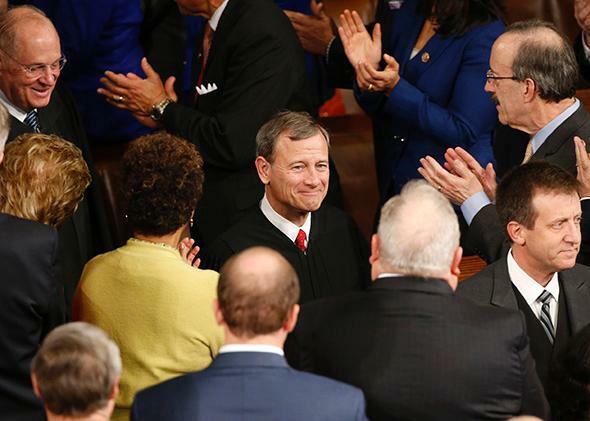 Chief Justice John Roberts, center, arrives for President Obama’s State of the Union address on Capitol Hill in Washington on Jan. 20, 2015. You note that Chief Justice John Roberts’ King v. Burwell opinion leans heavily on legislative purpose. That’s quite right, of course. But I think his opinion is just as noteworthy for what it doesn’t lean heavily on: federalism, or respect for states’ rights independent of the federal government. During oral arguments, Solicitor General Donald Verrilli—a man on a winning streak—struggled to defend the administration’s main point: that the Affordable Care Act could be reasonably read to grant subsidies to individuals in states with no exchanges. Justice Anthony Kennedy, in particular, seemed skeptical of that argument. But he seemed quite taken with a backup federalist argument made in numerous friend-of-the-court briefs. This argument stated that the law must be read to permit subsidies in states with no exchanges, because otherwise it would be unconstitutional. If the law forced states to set up exchanges before they received subsidies, Congress would be coercing a state to either create an exchange or risk sending its insurance market into a death spiral. And coercion this extreme violates the federalist principles enshrined in the Constitution. Following arguments, many commentators assumed that if the justices saved the law, Kennedy (and maybe Roberts) would do so under federalist logic. The reason is simple. While a federalist holding in King would give liberals an immediate victory, it might plant seeds for a future conservative jurisprudential revolution. If the court held that Congress can’t coerce states in this way, a number of other laws would immediately be constitutionally suspect. Congress regularly conditions grants or subsidies on a state’s willingness to adopt certain reforms. No Child Left Behind, for instance, requires states to meet numerous criteria before they receive federal education subsidies. Would that be unconstitutionally coercive as well? Happily, the court elected not to go down that dark path. Roberts’ holding doesn’t rest on the federalism argument at all. He does acknowledge that, if the federal government refused to hand out subsidies to states with no exchanges, many states would be put in a bind: Create an exchange, or suffer a death spiral. But Roberts merely uses this fact to illustrate that Congress could not possibly have intended the law to function that way—not to further a federalist agenda. In fact, as Ilya Somin pointed out, the word federalism does not appear a single time in either Roberts’ majority opinion or Justice Antonin Scalia’s dissent. To my mind, that suggests Roberts really didn’t view the King lawsuit as particularly worthy or sound. Had Roberts been on the fence, he might have used federalist reasoning to mollify conservatives. But he didn’t bother to split the baby this time around. Instead, he gave the president an even bigger victory than he could have hoped for. Perhaps that’s more proof that, to Roberts, this case was silly from the start. Read the previous entry by Marty Lederman.